I've been in a rather dark mood lately. Things have seemed grey both inside and out. I think the West Coast winter finally got to me, but I'm doing my best to shake it. What better way to get over the blahs than to jump in, do something spontaneous, new and really last minute. So with 15 minutes left on the clock I've decided to throw together a post and join the Second Hand First link-up over at The Citizen Rosebud. I've admired, and lurked at, The Citizen Rosebud for ages. I go there regularly for inspiration. If it weren't for writers like Bella, I don't think I'd have given shopping second-hand a second thought. This outfit includes three new-to-me items. 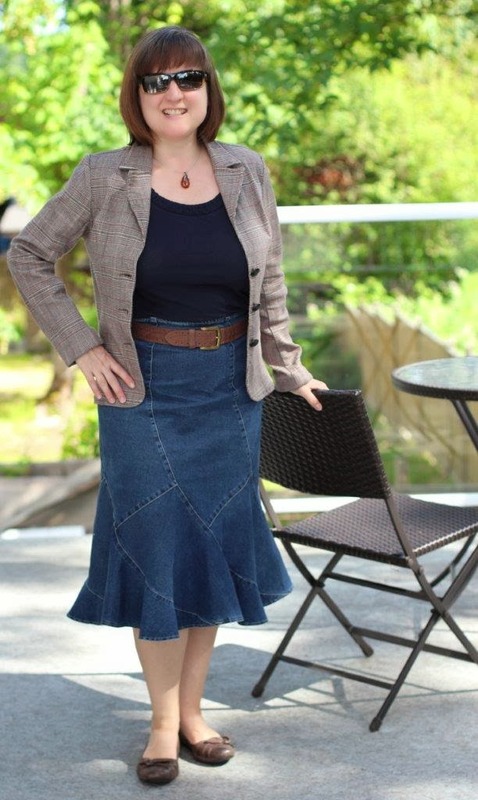 The skirt came from a consignment shop. The belt and the jacket were thrifted. Though I'm not quite a "second-hand-first" shopper, I am getting better at thinking about my clothing choices, and I am starting to consider issues like sustainability and ethical production before I hand over my cash. Shopping is a bit more challenging now, but I'm enjoying searching for clothing that feels good inside and out. And hello to you too! Welcome! Your kind words have made my day too. Thanks Bella! Neat combination! So glad you found some cool duds and given them a new home! Thanks Jan! So glad to hear from you!